We know Halloween is over! But in the spirit of the festive season, we’re highlighting a professional makeup artist and social media maven who goes by the name Queen of Luna. 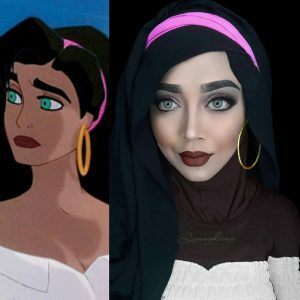 With over 360,000 followers on Instagram and counting, Sarawati can transform herself into just about any character you can imagine – and she uses her hijab to complete each look. Check out a few of her masterpieces. Why Are We Sharing Cool Makeup Art? Not only does representation matter in our communities, our politics, and our media — it matters in our workplaces. When each of us, no matter our gender, ethnicity, religion, or lifestyle, can see an image and example of ourselves in another person, we are building a world open to the innovation and diverse creativity that is so crucial to long-term organizational success. 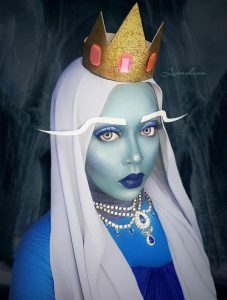 Queen of Luna’s makeup art is not only impressive, it plays an important role in the way we understand our differences — and the talents, interests, and skills that make our society and our organizations stronger. At Dignity & Respect Campaign, we focus on celebrating and building on ALL of our differences. Finding common ground by bringing our talents and mutual interests together, while embracing what makes us unique, not only makes for a better world, but a more creative, collaborative, and successful one. You can find more Queen of Luna makeup art on Facebook, Instagram, and around the Internet. Do your part to build cultural awareness (and awareness of really cool makeup art)! All images belong to Queen of Luna. We’re quickly approaching Election Day 2016. While months of news coverage and debate are behind us, we’re likely still feeling the effects of a highly polarized political climate. This election cycle has caused a particularly tangible rift between people, even between friends and family who don’t typically disagree with each other. Many of us have been active participants in online and in-person conversations about the candidates, their policies, and their scandals. Many of these conversations are likely to have been intense, even heated. Many are rife with misunderstanding. When emotions run high and even widespread viewpoints are so mismatched, it can seem impossible to find common ground. To top it all, fact becomes difficult to discern from fiction. Truths and untruths alike are coming at us from all directions, including our media. Do I have to respect the views of someone I disagree with? Do I have to respect that person despite their views, some of which I find harmful or false? Is it right to agree to disagree? When is it time to talk, and time to walk away? We aren’t always going to agree with each other. In fact, it’s pretty realistic to say that, quite often, we won’t. Conflict is a part of life. What we want to avoid is unproductive conflict. In the heat of an argument, we oftentimes become so wrapped up in the point we’re trying to make that we don’t take a moment to, first, listen to ourselves, and second, understand where someone else is coming from. That misunderstanding gets us nowhere. The way we can start to make progress is by building personal awareness, and encouraging others to do the same. START WITH YOU. Understand how you see yourself, how others see you, and how your filters guide you and influence your behavior. SWEAT THE SMALL STUFF. Understand the concepts of intent vs. impact. Become mindful of how you respond to others and be responsible for your words and actions. Our differences shouldn’t tear us apart. Making the effort to become more aware can put us in a better position to understand each other, and it builds our ability to argue intelligently and effectively. When someone’s viewpoint is harmful to others, it’s up to you to decide whether to make that person aware of the harm. However well-intentioned we are, remember that we don’t often get anywhere when we try to force our ideas on someone who doesn’t want to hear them. We don’t have to agree to disagree with someone who is spreading harmful views. We do, however, need to build up the respect, awareness, and tools that can overcome those views. Taking time to understand where someone is coming from and seeking out what you have in common is a place to start. Providing resources, rather than telling someone you think they’re wrong, can go far. The smarter we fight, the better we become. When we take steps to understand each other, the results might not be immediate. In the meantime, it can be difficult to be respectful. It’s even harder when the person we’re talking with doesn’t respect our views – or us. Tip #9 of our 30 Tips is this: Demonstrate Mutual Respect. While we can’t force someone to respect us, we can lead by example. Each person is fundamentally worthy of respect and dignity. Someone you disagree with, who holds beliefs or viewpoints that are different than yours, is still someone. We encourage you to download the 30 Tips of Dignity and Respect and learn about the 7 Pillars, which can be incorporated into smarter, more effective discussions about Election 2016 and beyond. If you want to use your organization or workplace to make the world a better place for ALL of us, with ALL of our differences, contact us for information on our workshops and speaking engagements!